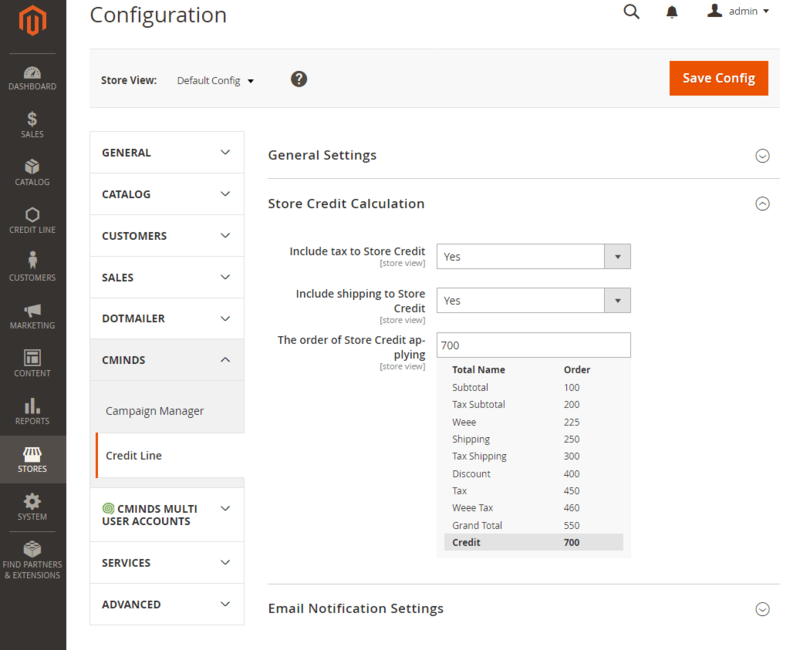 Our Magento Store Credit extension provides customers with an option to purchase using store credit and pay the balance manually or automatically. Customers can check available credit and complete purchases using the store credit line. 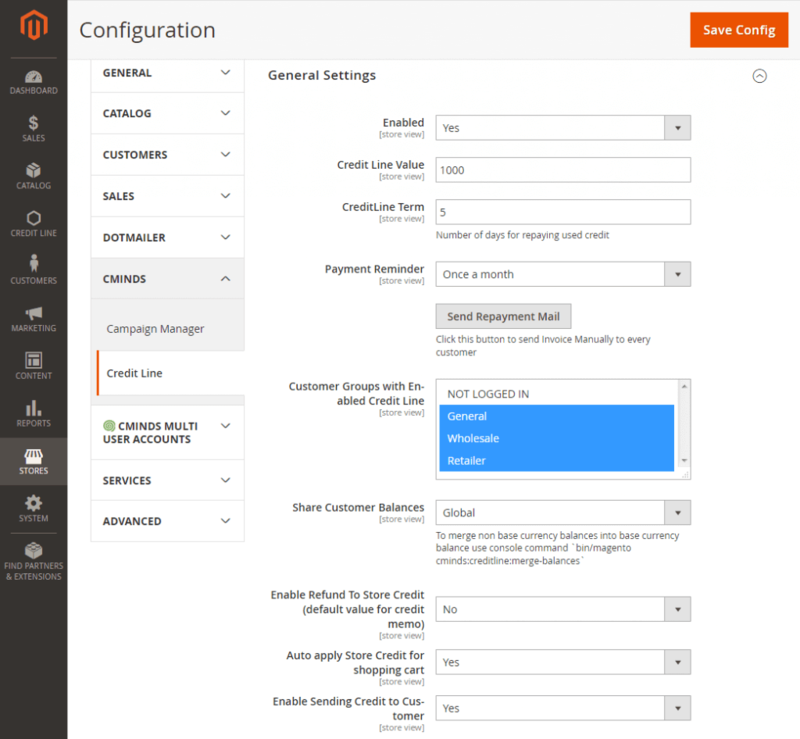 The Magento Store Credit Extension allows the store admin to provide a line of credit to their customers. Customers can check their available credit at any time, complete a purchase using the store credit line payment method, and pay the balance from their customer account. 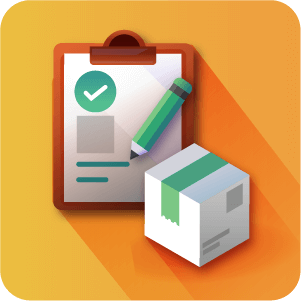 Usually in B2B business, one of the essential aspects of purchasing is developing a store credit line, letting customers purchase goods up to the your approved credit line limit without any hassle, just place the order and get the goods. 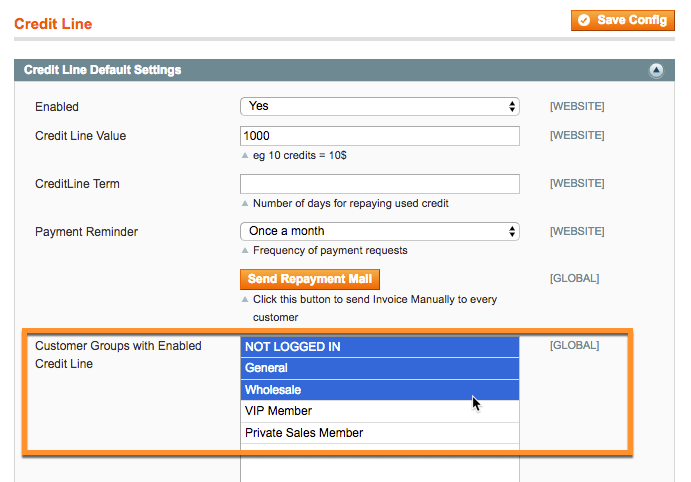 The Admin can set a store credit limit globally or for specific customers. Other features include automatically sending invoices and credit term (how much time a customer has to repay the credit). During checkout, the customer will see 'Store Credit' as one of the available payments options. Customers receive a notification with their balance and can pay their balance directly. The Admin can also send manual notifications to customers to pay their balance. 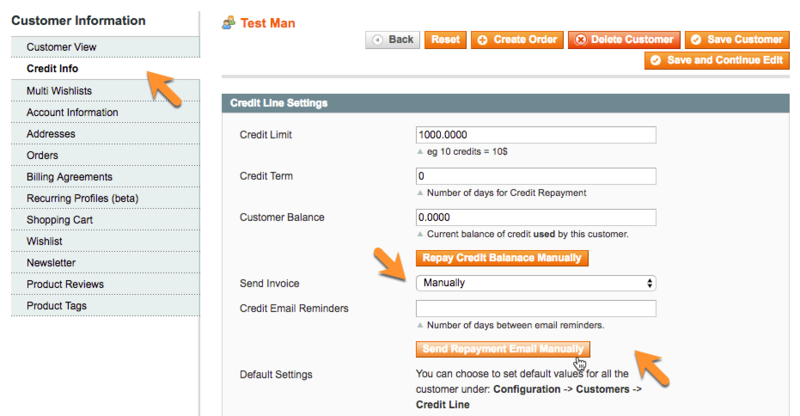 Customers can pay their credit balance at any time from their dashboard, as well as check previous transactions. 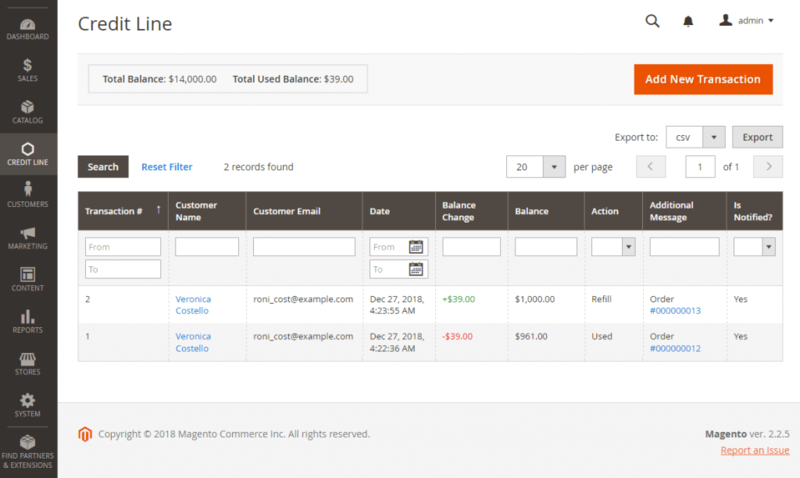 The Admin can also set monthly invoices or statements for customers to pay their balance. 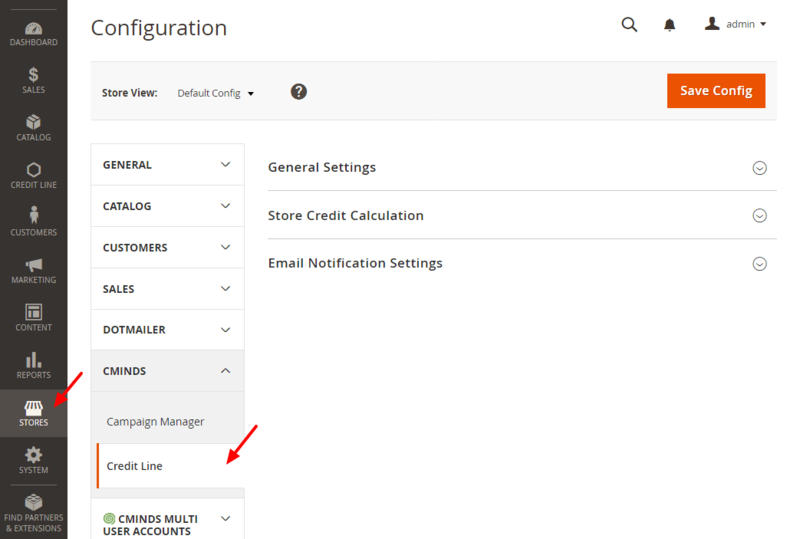 Set a store credit line for customers – The admin can set a default store credit for all customers or for specific customers. 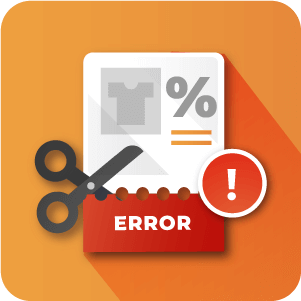 Allow store credit for specific customer groups – Store admin can decide which customer groups are allowed to have a line of credit. 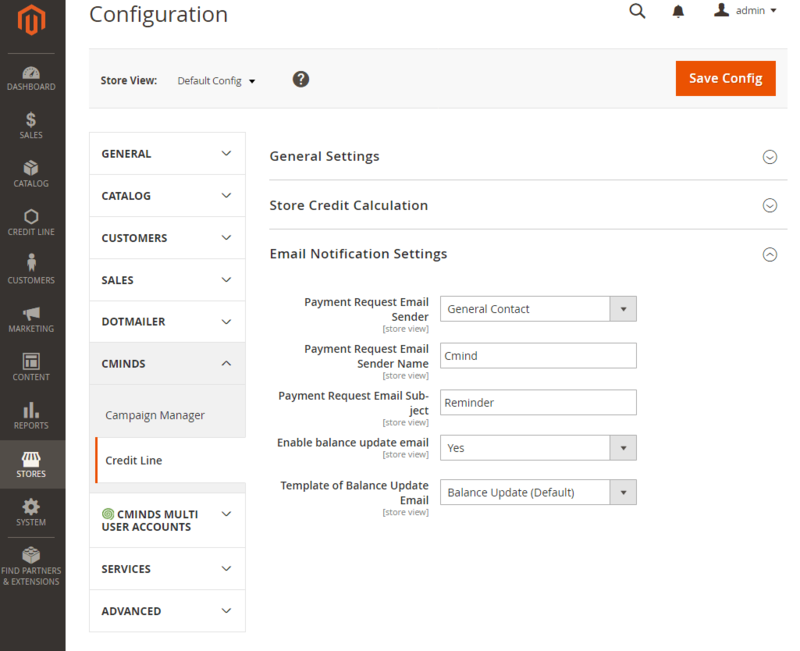 Decide how to charge a specific customer and when – The admin can decide whether or not to charge customers using an automatic invoice sent to their email or by sending one manually. 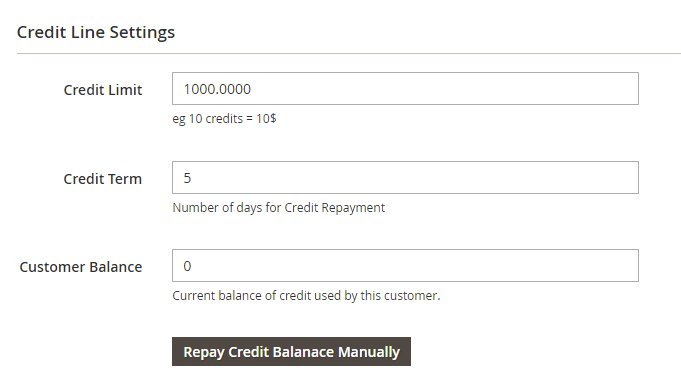 If customer invoices have not been paid, admin can disable the store credit – When setting store credit at 0, the store credit payment method will not be available for the customer. 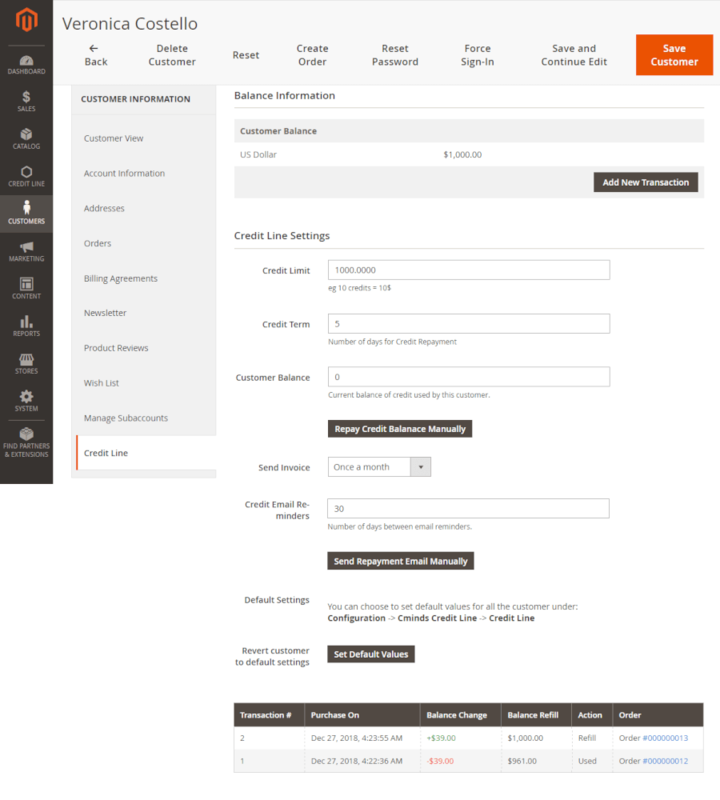 Customer Dashboard with Credit Report – Customers can easily see their credit amount and their account purchase activity. Customers can also pay their balance at any time. 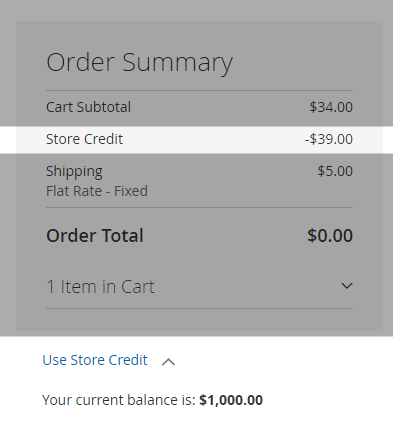 Set a default store credit line for all customers. 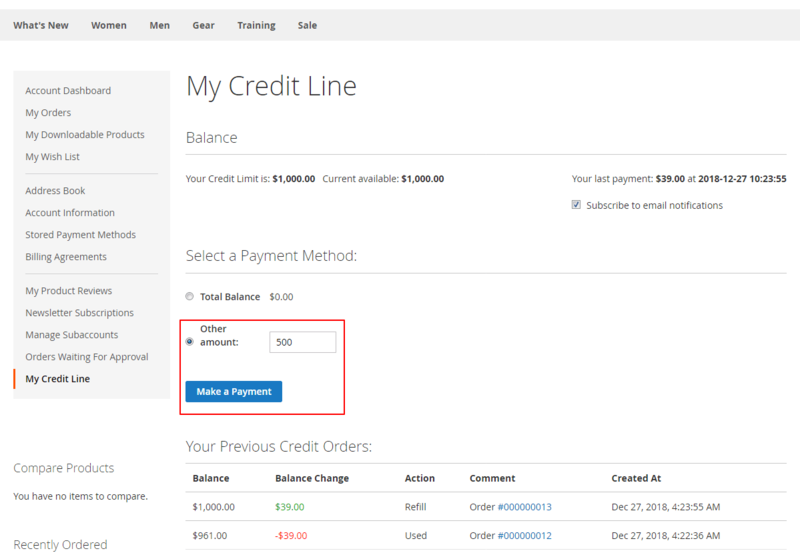 Allow store credit line for individuals, customer groups or all customers. Send manual invoices for an outstanding balance. 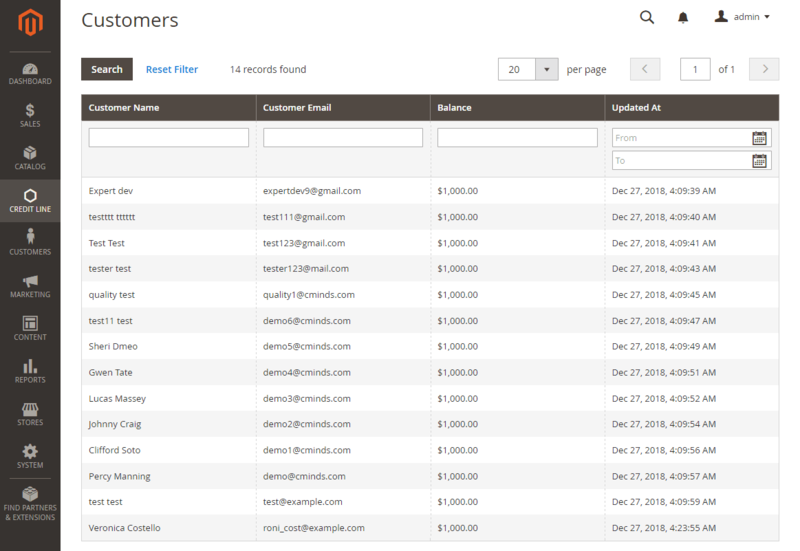 Set automatic invoices to be sent to customers periodically. 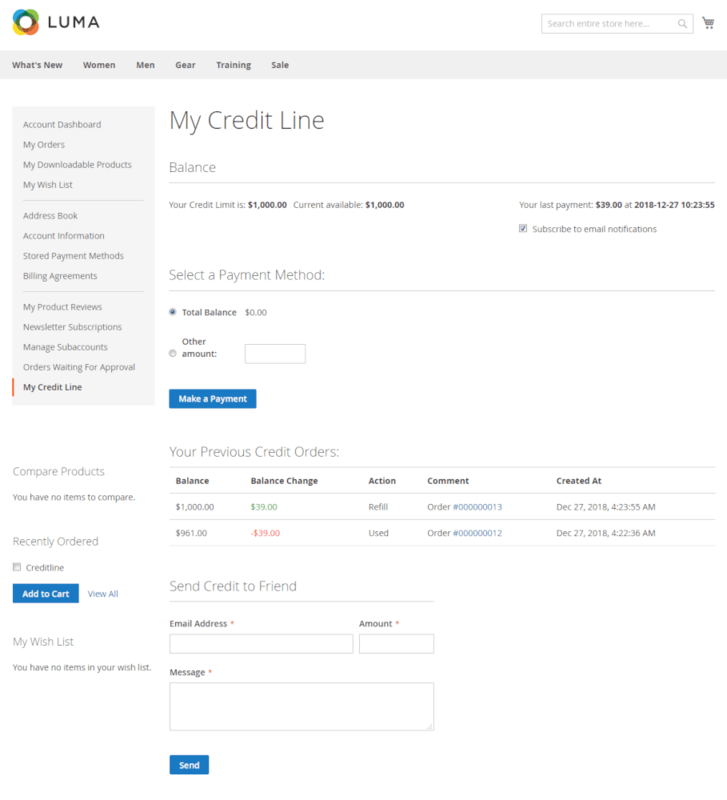 Hide store credit line payment option if credit line is 0. 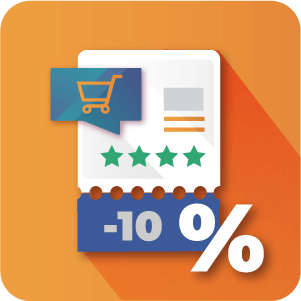 Customers can see their available store credit line during checkout. Customers can see their entire purchase history using store credit line, in their account. Customers can pay their balance from their account. Customers have a “pay now” button on their account to pay their balance at any time. Do all customers have a credit line? 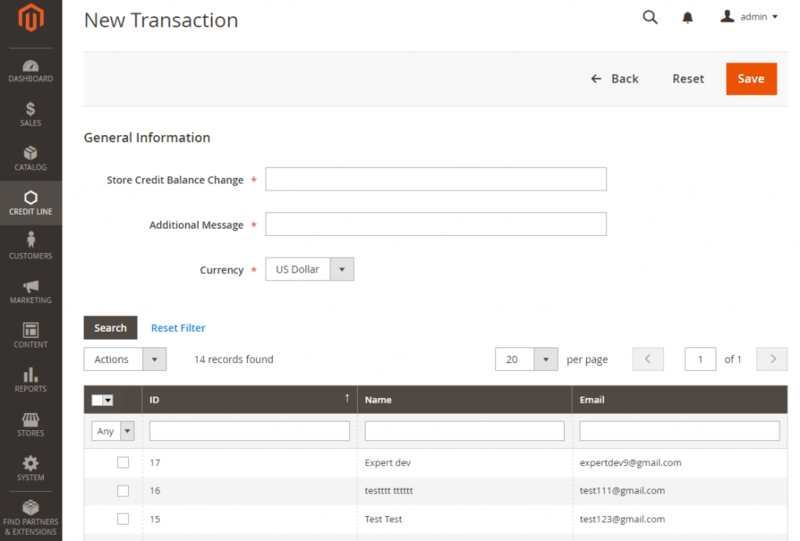 It’s possible for the site Admin to either assign lines of credit to site users according to User Groups in the Extension Configuration settings or else on an individual basis through the customer view. Can the admin send an invoice to pay an outstanding balance? Yes. Admin can go to the customer account in the backend and send an invoice for payment of an outstanding creditline balance. 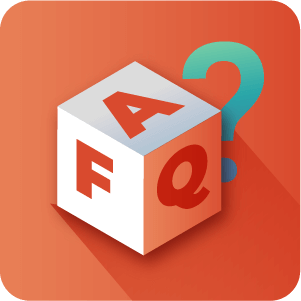 What happens if a customer does not have enough credit left to complete a purchase? 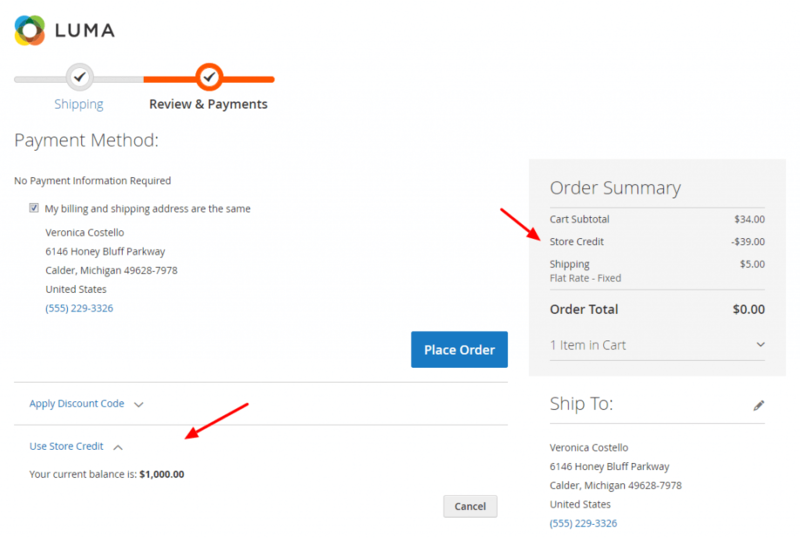 In case the customer does not have enough credit they will not be able to purchase the product using the Credit Line payment method. They will either need to top up their credit balance or choose a different method of payment if there is one available. Can admin set a monthly invoice sent to the customers to pay the outstanding balance? Yes. 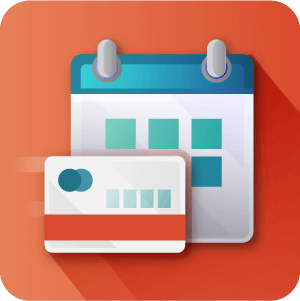 Admin can set invoices to be sent once a month, based on an interval of a chosen number of days, not required or else to be sent manually. 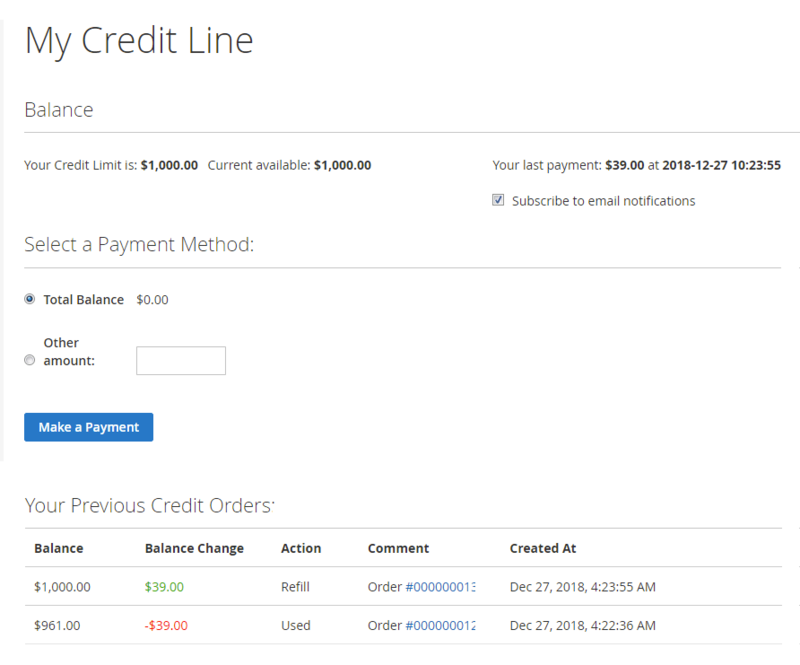 Is the credit line orders history available in the customer account? Yes, Customers can view their credit line use history from the Customer dashboard. Admin are also capable of viewing the order history of All or specified customers from the Admin dashboard for Credit Line purchases. Fix: configuration shipping option breaks the page.